When I was growing up, we lived in a house that had a huge backyard. I had lots of friends on my block, and my two younger sisters and I loved to be outside. The only time we stayed indoors was when the weather was really mucky. Time has a way of dilulting our memories a bit, where it’s difficult to remember exactness. 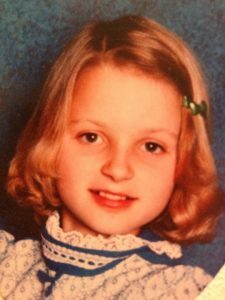 I think I was about 10 years old, and about to go through the most difficult experience of my young life. I was the oldest of three girls. My parents were getting a divorce. My dad wasn’t around much. He traveled for his job, and he drank alot. And while I’ve learned so much in my adult life about human needs, and what he was attempting to get for himself through drinking and his choices, the young me felt it as severe abandonment on both a physical and mental level. 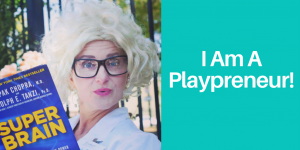 How I Incorporated Play Into My Personal And Professional Life. Well, everything , because what I lost in my childhood, I decided I would make up for in my adult life. You see, I get to decide now how I’m going to interact with the world. Choosing to bring my playful side through my business and personal life, is paying homage to the younger me that wanted to just be a kid. Revel in the mystery and magic. Live life full of joy and curiosity. Not worry about what it looked like to others, or how I would be judged. Feel safe and loved. Now, I heal every day that I play. It’s pretty profound. Looking back, I was a Playpreneur in the making. I loved building forts, and creating fun experiences for others. One time, my sisters and I built a backyard circus. We had a kiddie pool where we placed a plank of wood over it to walk across. We had funny toys, and I think even a few live fish in the pool. When you walked the plank, it felt like the deep, blue sea underneath you. We had swings, and big trees to climb. The neighborhood kids got so excited, and ran home to get money from their piggy banks. They lined up to share in the fun that we had spent so much time creating. They wanted to experience and feel the excitement we felt. After all, excitement is contagious. My sister’s and I were so blown away that we could make money creating experiences for our friends, and then the doorbell rang. They didn’t understand the value of what we had created. We were young entrepreneurs, and instead of encouraging us, they inadvertently squashed our dreams and initiative. The young me had the stool kick out from underneath her, and she felt disillusioned, injured, and deflated. And to top it off, then came the years of suffering through the divorce. My dad’s absence severely damaged my delicate heart. I built a hide-out in my mind, and retreated to it for a long time. Can you relate? Inner child work is so profound. When I’m working with my clients, most often we’re healing the trauma that their younger self faced at such a tender age. I whole-heartedly encourage you to heal anything that still lingers, and that might be getting in the way of allowing the kid in you to express their beautiful, creative self. It’s time to heal your inner child. It’s time to not take yourself so seriously. It’s time to revel in the magic that is life. We’re witnessing movements to do just that. To have fun, for the sake of having fun. Burning Man, and other festivals are a good example. Creative expression is becoming more, and more of a core value for people, and the younger generation gets it. They’re redefining what it means to be a Kidult. My proposition to you? Give play a leading roll in your life. Ask yourself these questions. How do you play in your life/biz? 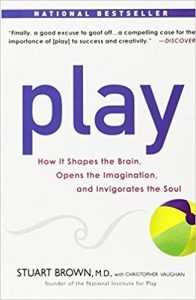 In his book, you learn about the 8 different play personalities, and discover your own. Another point about play, is it helps us connect to each other. We learn about each other through play. We’re also smack dab in the middle of the Experience Economy, which means people are valuing “experiences” over “things” and they want to connect with real, authentic humans. The book explains so much. I’ve got a well-worn copy of Play on my desk, and I refer to it often. Check it out here! It’s my divine mission to inspire through example. Remember Gandhi’s quote: “Be The Change You Wish To See In The World.” If you want to see me playing around, you can visit my Youtube channel here. If I can help you in any way, I’d be honored.